Spiraea is a genus of around 80 species of deciduous or semi-evergreen shrubs found in rocky places, thickets and woodland. Widely distributed in northern temperate regions of Europe, Asia and North America including Mexico. Spiraea have alternate leaves that are entire, toothed or lobed and in many species are decorative. Two Spiraea species are commonly used for bonsai, S.japonica and S.thunbergii. Spiraea japonica is a clump forming, deciduous shrub with erect shoots, native to China and Japan where heights of around 2metres are reached. It has ovate, sharply toothed, dark-green leaves to 10cm long. In mid- to late-Summer, it bears bowl-shaped, pink or white flowers in terminal corymbs to 20cm across. As a popular garden shrub, Spiraea japonica has a large number of varieties which carry varying leaf and flower colours. S. thunbergii is a dense, bushy, deciduous or semi-evergreen shrub with arching branches and slender, lance-shaped, sparsely-toothed, light-green leaves to 4cm. In Spring and early Summer, it bears bowl- or saucer- shaped white flowers in clusters to 5cm across. Native to China and Japan where heights of around 1.5metres can be reached. POSITION Full sun. Frost hardy to -10°C. PRUNING Spiraeas produce numerous long arching shoots from old wood in Spring and these need to be pruned back hard or removed to keep shape. After this, pruning should be stopped to allow flowering to occur. After flowering, prune back repeatedly to shape through the remainder of the season. Deadhead spent flowers. Once branches have hardened and lignified they become very brittle; wire whilst shoots are still young. PROPAGATION Take greenwood cuttings in Summer and hardwood cuttings in Winter. PESTS AND DISEASES Trouble free though mildew can be a problem in warm, damp conditions, if so provide a position with better air-circulation. STYLING Suitable for informal upright, slanting and cascade forms in extra-small to medium sizes. 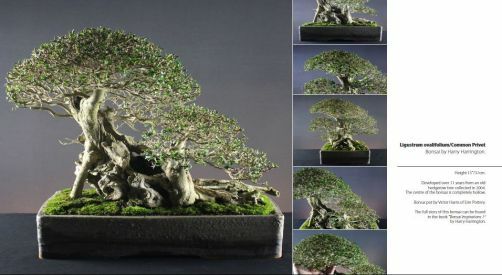 Particularly suitable for clumps or root connected bonsai.